Alienware Aurora ALX is a high performance gaming desktop system that features AMD FX series processors with integrated memory controller, Dual Core technology and fast HyperTransport technology or AMD dual core X2 processors. 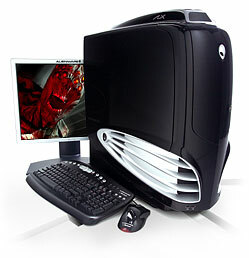 Also in the gaming specifications are AGEIA PhysX physics processing unit, Silent Liquid Cooling technology, ActiveArmor hardware-accelerated firewall, NVIDIA nForce4 SLI MCPs, Serial ATA-300, Creative Sound Blaster X-Fi XtremeMusic and runs on Windows XP Professional SP2, and is Windows Vista Capable. CNet (link dead) gives a very good rating of 7.5 out of 10 and concludes that if you can stomach the price, Alienware’s Aurora ALX SLI serves up big 3D gaming performance backed by some of the best customer service you’ll find.